Some athletes are born with natural talent, while others are extremely hard workers. The best of the best however, possess the perfect combination of talent and impeccable work ethic. Such is the case with Muay Thai legend Saemapetch Fairtex. Representing the famed Fairtex Gym in Pattaya, Thailand, Saemapetch looks to continue his winning ways when he meets the streaking Alaverdi “Dagger” Ramazanov in a ONE Super Series Muay Thai contest at ONE: CONQUEST OF CHAMPIONS on Friday, 23 November in Manila. The Thai martial arts hero is coming off a victory over Deividas Danyla back in July. Born and raised in Chiang Mai, life was hard for Saemapetch and his family. Living in poverty, their primary source of income was collecting plastic bottles used for recycling. At the age of 11 however, Saemapetch stumbled onto the martial art that would ultimately turn his life around. Knowing that it would be a way to help earn money for his family, Saemapetch decided to give Muay Thai a serious try after being invited by the town mayor. Immediately, Saemapetch saw his own talent and potential, and knew that if he dedicated his life to the sport, it would be a way to bring his family up from poverty. “I wanted to do this to support my family and provide them with a good life,” he stated. Pairing his skills with hard work, Saemapetch evolved into a talented student of the martial art and was soon on his way to stardom. 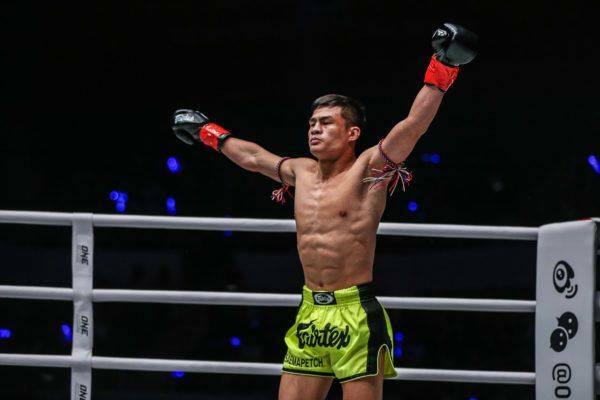 Three years after first deciding to take up “The Art of Eight Limbs”, Saemapetch made it onto the big stage as he debuted at the famed Rajadamnern Stadium in Bangkok, where many world champions have been made. Even while fulfilling a childhood dream of serving in the military, Saemapetch’s love for martial arts shone through. Eventually, Saemapetch shifted his focus back to Muay Thai and has since become a bonafide star in his home country. Now, the 23-year old is a veteran of over well over 100 professional Muay Thai bouts, boasting a 115-16-1 professional record. Some of his accolades include the Tiger Cement Tournament Championship at the Channel 7 Stadium and the Muay Thai Grand Prix Welterweight World Championship. Competing on the biggest stage of martial arts in the world, Saemapetch has just one goal in mind. “I want to win a ONE World Title and be one of the top fighters in the world,” he concluded.